ALMS course comes to an end. It has been quite a journey, and not the way I thought it would be. I was planning to get the four credits from ALMS, but due to many other courses I had to change my plans and do the two credits instead. The most important lessons I feel I have learned in Kenneth’s academic writing and presentation courses. In academic writing we had plenty of homework and we wrote an academic text ourselves. 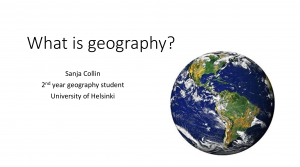 In presentation class I prepared a presentation about studying geography and different fields of study in geography. I got good feedback and useful tips on how I should improve my presentation skills for next time. The presentation was about 15 to 20 minutes long and I had to practise reading it aloud for many times. I was planning to read an entire novel. I read the first couple of chapters, but I feel like the book was not for me. I am more of a holiday reader. I read so much in University that I feel like I don’t have the motivation for it in my “free time”. A comedy with black humour. Ton of great actors including Robert DeNiro, Sean Penn and Bruce Willis. A documentary about nomads and their lifestyle. In this episode Kate Humble travelled in Nepal and studied the nomad people’s habits. I have a course in this period about geoinformatics. We have some course supportive reading in English that is non mandatory to pass the course or to get the required credits. I decided to get familiar with the English terms and vocabulary of geoinformatics. 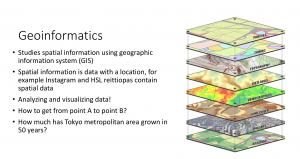 Geoinformatics studyes spatial information using the geographic information system (GIS). Spatial information is basically information that has location connected to it. For example, Google Maps, Instagram, Facebook and other social media channels all contain spatial information. Google maps shows us a way to quickly get from point A to point B, and Instagram let our followers know where we had been the moment when the photo was taken. Facebook can advertise us content based on our current location. 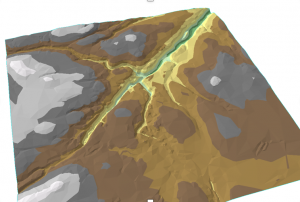 I read the article “Interpolating Surfaces in ArcGIS Spatial Analyst”, written by Colin Childs (2004). Interpolation is a way of visualising and analysing spatial data. Spatial data can be points, lines or areas. Data can be vector based or raster based. Interpolation is a tool that can predict what information is around a spatial data point. For example, most of large weather forecasts are made with interpolation. 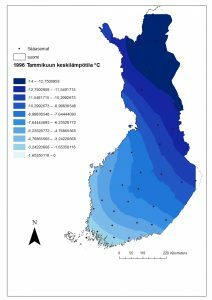 No one can measure the exact temperature everywhere in Finland, but with interpolation one can guess what value the surrounding areas contain. Interpolation is never completely accurate, and there are plenty of different ways to do interpolation. Spatial autocorrelation is an important aspect to know before analysing the data any further. Spatial autocorrelation defines whether the data and values have any connection or correlation between them. For example, values that are close to each other are usually more similar than values that are far away. When choosing the appropriate method, the user must know what is the best way of interpolation for the user’s data. Some interpolation methods are local like the TIN and IDW methods, and others are global like, for example, the trend surface. Local means that only the nearby values affect a point’s value, and global means that by changing one value, the others are also affected. Here are a couple of maps I have made using interpolation. 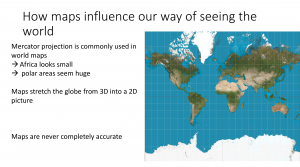 Presentation skills, What is geography? 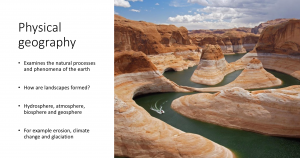 I made a presentation about geography and what it is like to study geography. The presentation was about 15 to 20 minutes. I got some great feedback from Kenneth on how I could improve my presentation skills etc. Here are a few screenshots from my slides, because the original file was too large for this blog. I read this geography article Statistical modelling predicts almost complete loss of major periglacial processes in Northern Europe by 2100, published by Juha Aalto, Stephan Harrison and Miska Luoto. I couldn’t find any contractions, direct questions, or the use of the word you. The article represents academic style. The article is very specialised, and the reader should have some geography background to understand it. The articles style and text is not very fluent and easy to read. Chapters do not necessarily follow each other in a continuous way. The style is very heavy to read. Overall, a great article. I got some great feedback from Kenneth, and changed my text a bit. Kantaväestön pakoa? Miksi maahanmuuttajakeskittymistä muutetaan pois? In the article “Kantaväestön pakoa? Miksi maahanmuuttajakeskittymistä muutetaan pois? (Yhteiskuntapolitiikka 5/2013) Katja Vilkama, Mari Vaattovaara and Hanna Dhalmann have studied the ethnic and socio-economic segregation in the Helsinki metropolitan region. The aim of the study was to investigate the reasons for migration, and to determine whether the so called white flight happens in Helsinki. The white flight theory was originally developed in the United States, and according to the theory the white population of an area starts to move away as the black population grows. The white flight theory in this study is associated with the increase of immigrant population in an area of Helsinki. For decades, Helsinki has been one of the fastest growing urban areas in Europe, and a major part of this growth has been due to increased migration. The proportion of immigrants is predicted to reach 20 percent by the year 2020. Areal differentiation is becoming a reality in Helsinki, and this can create a number of both social and societal challenges. Suburbs and neighborhoods show increased differences in their level of income, unemployment rate and ethnic structure. Research has also shown that immigrants are more likely to move to areas where the ethnic diversity is already high. Moving behavior can be explained by so called push and pull factors. Push factors are the usually negative features that drive people to move away from an area, while pull factors are positive factors that make an area tempting and appealing. For instance, social problems, an unpleasant environment, a lack of greenspace, feelings of insecurity, and undesirable location can cause people to seek a more suitable living environment. The main objective of the study was to examine the motives and reasons for the original population to move to a different neighborhood. Does the increasing number of immigrants in an area drive the original population away? Do the increasing socio-economical problems cause the original and usually wealthier population to vote with their feet? The results of the study give interesting answers to these questions. I have attended two academic writing sessions so far. We had a homework assignment to write an academic text. I chose to write an academic summary of an article. My first draft is below. I will write more and work on the style. In the article “Kantaväestön pakoa? Miksi maahanmuuttajakeskittymistä muutetaan pois?”(2013) Katja Vilkama, Mari vaattovaara and Hanna Dhalmann have studied the ethnical and sosioeconomical segregation in the Helsinki metropolitan region. The aim of the study was to investigate the reasons for migration, and to determine whether the so called “white flight” happens in Helsinki. For decades Helsinki has been one of the fastest growing urban areas in Europe, and a major part of this growth has been due to the increase of migration. The proportion of immigrants is predicted to reach 20 percentage by the year 2020. Areal differentiation is becoming a reality in Helsinki, and this can create a number of both social and societal challenges. Suburbs and neighborhoods show more and more difference in their level of income, unemployment rate and ethnical structure. Research has also shown, that immigrants are more likely to move to areas where the ethnical diversity is already quite high. Moving behavior can be explained through so called push and pull factors. Push factors are the usually negative features that drive people to move away from an area, while pull factors are positive factors that make an area tempting and appealing. For instance, social problems, unpleasant environment, lack of greenspace, feeling of insecurity, and bad location can cause people to seek a more suited living environment. The main objective of the study was to examine the motives and reasons for the original population to move to a different neighborhood. Does the increasing number of immigrants in an area drive the original population to move away? Do the increasing socioeconomical problems cause the original and usually more wealthy population to vote with their feet? For this post I listened to three ted talks from different subjects. I wrote down vocabulary that I wasn’t familiar with or I didn’t know the correct transformation for. an allusion= vihje, viittaus, An indirect reference; a hint; a reference to something supposed to be known, but not explicitlymentioned; a covert indication. I had my first academic writing session on Wednesday. I also met with my counselor, who gave me good ideas on how I should study and improve my English skills. The fist academic writing session was very useful, although we didn’t get to write anything yet. The lesson gave me a clear image of what academic writing is and is not. I did the homework that Kenneth assigned for us. My answers are below. This model can be used to analyse the effects of several parameter changes. There are many reasons for the fall of coffee prices./ Coffee prices have fallen for many reasons. Recent research shows that the arms are commonly used for protection during a fall to the ground. So far no comprehensive study has been made in investigating/addressing the role of smiling in gaining the initial trust of individuals. Some studies have suggested/concluded that bamboo could be more widely used than now. These special tax laws have been enacted in six stated including Illinois, Iowa and Ohio. There is little research on the use of oil palm shell as coarse aggregate in the production of concrete. For example, because, because of this transparency, so that, are also more effective than other methods, however. Text B is more fluent and has better “flow”. Text B uses many phrases and words to move from one point and sentence to another. Text A just has a lot of short sentences that are not connected to one another. … internet access, many of these…. …internet use;/. F/for example, they… ….. information, or they may…..
A WordPress Commenter on Moikka maailma!